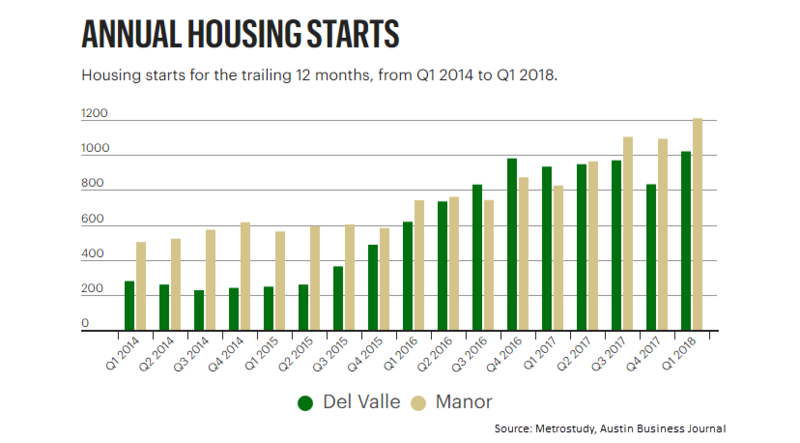 ​​​​​DEL VALLE, MANOR – Annual housing starts have steadily climbed in both cities since 2014, yet the market really started heating up in the past of couple years, Metrostudy data show. In Del Valle, construction has started on 1,020 new homes in the 12-month period ending in first quarter 2018, compared to only 279 home starts in the same period ending in 1Q 2014. In Manor, housing starts over 12 months hit 1,210 homes in first quarter, up from 502 four years earlier. Developers say the growth spurt is fueled by buyers’ quest for affordability, as most homes in the new communities range from $200,000–$400,000.